Order 2" larger than pant size. For example, if you wear a size 34" pant, buy a 36" belt. Hand made in Italy- every detail is perfection. The leather is tough, but soft to the touch. 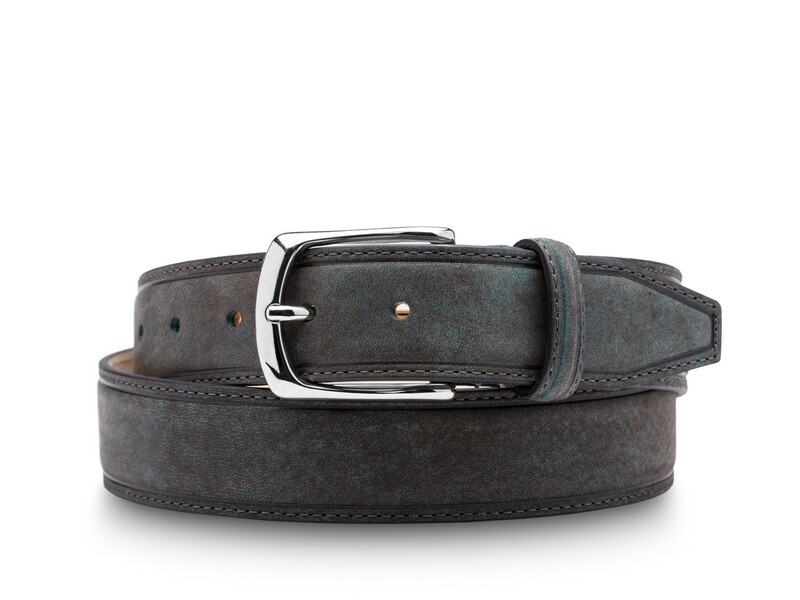 The two-tone finish is steel grey with undertones of "steel blue" and a brass buckle with nickel finish completes the look. Bosca belts are made to the same standards as all of our other products. That means that they are designed and built to “wear in, not wear out.” I love that little saying. I predict that the belt you choose will become one of your favorite possessions, and your appreciation for it will grow and grow over time. I think, however, that you might want to consider buying more than one- we have quite a range of looks. Most of the belts in this collection are 35mm in width. This is a little more than 1 3/8” which is just a hair wider than “traditional.” As with all things, the guiding design philosophy for Bosca belts is that we come from a place of traditional, but we always find a way to make it fresh and new, not stuck in the past. Nice, wearable, usable…fresh. Buckles are cast from a variety of materials, but largely from brass, and finishes are also various, but always with the highest quality of lead-free plating techniques. This collection of belts uses some of our most established leathers like our hand-stained Italian veg-tanned Old Leather, our super soft Nappa Vitello, and the road-warrior but buttery soft naturally shrunken Tribeca. We also use some other beautiful Italian and Argentine leathers that are molto atrisianale- artistic in their look, feel, and effect. 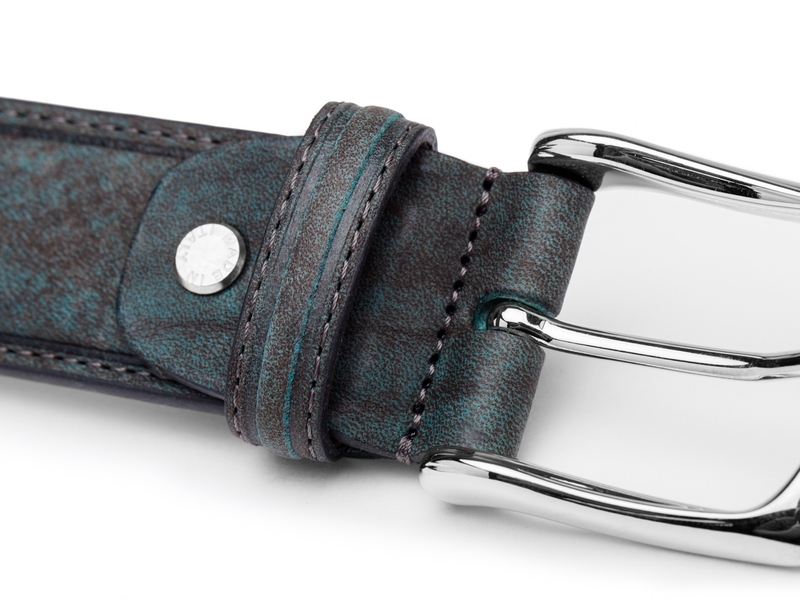 Unlined belts are resin-coated on the back to give a casual but finished look and feel. Leather really is one of nature’s amazing gifts to us. It is one of the few things which can get better with age. I like to think that people do, or at least can, fall into the same category, if we take care of ourselves, eat well, and stay engaged with life. Rest assured- with a Bosca belt you will never need suspenders- even, heaven forbid, they ever do actually come back in style. How do I buy the right belt? I’m so glad you asked. How a belt is measured: 1) a belt with a traditional “tongue buckle is measured from the middle hole to the end of the buckle where it is stitched to the belt. 2) A belt with a “plaque buckle is measure from the middle hole to the pin on the plaque buckle. This measurement corresponds to the size that is stamped on the back of our belts in both inches and metric measurement. If you have, or the person you are buying for has, a belt that fits comfortably when bucked at the middle hole then look for a size on the back of this belt. If you know your pant size then buy a belt that is one size larger than the pant size. This is because the belt needs to go around not only the waist but also the pants. If you don’t have a belt or a pair of pants already I’m not sure that you are candidate for one of our belts. If you insist, you will need to measure you actual waist. Use a tape measure around the waist while wearing pants typical of what you normally wear. This measurement is the size belt you want to order.